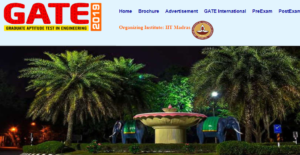 GATE (Graduate Aptitude Test in Engineering), an examination conducted to providing admissions in IITs (Indian Institute of Technology), NITs (National Institute of Technology), CFTIs (Centrally Funded Technical Institute) and IISc (Indian Institute of Science) under M.Tech/M.E./M.Arch/M.Plan/MCA etc. courses. This time, IIT Madras has given responsibilities to conduct the GATE exam successfully following which, official website – gate.iitm.ac.in has been launched. Earlier, the Institute made the website accessible but, after some time, it stopped working (it was the testing period as we are expecting). Now, the Institution has launched the website again along with that, a brochure as well for the examination. As per the schedule published by the administration, registration process for the examination would begin from 1st September. All the applicants need to submit their applications before 21st September. The extended closing date for submission of online application is 1st October. One of the major changes made in the GATE 2019 is, the examination would be organised for 24 subjects instead of 23 subjects. The subject included is Statistics. Applicants must submit their forms before the closing date through GOAPS website – appsgate.iitm.ac.in. Applicants also need to upload the photograph, signature, certificate of qualifying degree, caste certificate (if applicable) etc. ID number of Passport/ PAN card/ Voter ID/ Aadhaar-UID/ College ID/ Employee and Driving License. Application Fee: Candidates need to pay the prescribed fee through net banking or debit card or credit card. Online transaction charges must be borne by candidates. Exam duration for all the papers is three hours. Each paper consists of 65 questions for a total of 100 marks. As the GATE 2019 would be the computer based test, and thus, the computer will automatically close the screen once the duration is over. All the aspirants have to occupy their allotted seats 40 minutes earlier of the scheduled start of the exam. They would be able to log in and read instructions 20 minutes before the examination. In the exam, there would be multiple choice questions carrying one or two marks. Negative marking: 1/3 mark would be deducted for the incorrect answer of the question of one mark while 2/3 mark for 2 marks MCQ. To Get Latest Updates, Stay Tuned With ALL INDIA ROUNDUP.